A flawless masterpiece about the devotion of a true devotee…..that is the story of God’s Pauper written by Nikos Kazantzakis. The epic story of the life of one of the greatest Saints in the world is narrated in a lucid & yet heart wrenching fashion that makes the reader one with the pain & passion of the man behind the Saint. Being a passionate believer & student of the Franciscan way of life, I find this book quite in keeping with not only history but also with the current ideas religious personalities have about the pain behind the total annihilation of the ego (flesh in the case of Saint Francs of Assisi). Kazantzakis in a simple way reveals to the reader not only the life of Saint Francis. The writer does us a favour for which I shall be ever grateful to him as a reader…..he makes the life of this pauper very REAL ! We generally find the lives of most of the Christian saints highly above our normal dealings & therefore most of the time ignore their life histories as well as their writings which seem rather dogmatic….not in keeping with our practical mind-set. Kazantzakis is aware of this failing & therefore, brings out the true side of Saint Francis of Assisi…..the struggling man to become one with his creator. It is not the lofty saint that we encounter in this classic work but, the lowly man trapped by his love for God & the desires of his flesh which he wishes to overcome. The person that we witness in this narrative is the human being that signifies ALL of us with all our faults, yet wishing to love God in perfection sans faults & sinful ways. This is not merely a religious document, but a mirror into the heart & mind of one of the greatest mystics of the Medieval Age in Europe. In fact, I would not be wrong if I stated that this novel is the life story of a revolutionary. Saint Francis of Assisi indeed was a revolutionary not only where his thinking was concerned but also his ideals on the way his society was progressing. Kazantzakis brings to us that revolutionary. The story is narrated by St. Francis’ close comrade & fellow friar Brother Leo who although not all that divinely in tune with God (unlike his friend St. Francis) yet loves St. Francis to such an extent that he goes through the worst of situations to prove his loyalty & devotion. Brother Leo in this novel undergoes the hardships of whipping, self-torture, weather changes, sickness, hunger, thirst, mental turmoil etc., all because of his loyalty toward the person he considers to be quite sure about everything heavenly. More than just the narrator however, Brother Leo in this novel signifies…all our doubts…the scepticism that we are born with & in more than one way does he bring out his doubts. Through him, it is we who are questioning the authenticity of God & the divine call of St. Francis. Just like Brother Leo, we do not question because we think we are more than human….we question because WE ARE HUMAN & can a mere human become a saint? Can a human give up the longings of the flesh? Can a mere human overcome the impossible? These are questions posed to us & by us throughout the book. The characters in this story may have been moulded in a different way by the author so as not to break the rhythm of the narrative….but they all did exist, this is history, and this is fact. Not only was there the ever loyal but doubtful Brother Leo but there was also the loving Saint Clara who followed in St. Francis’ footsteps ; not only was there a devoted Lady Pica the mother of St. Francis but also the crafty Brother Elias who twists the rule of St. Francis to his own liking & for his own self glory. These were REAL people like you & me who lived during troubled times & yet were asking the same questions about God & humanity that we are asking today. The author himself has stated in the novel that he has added many stories from his own imagination at times so as to link together certain intricate parts of the legend of this peculiar medieval saint. 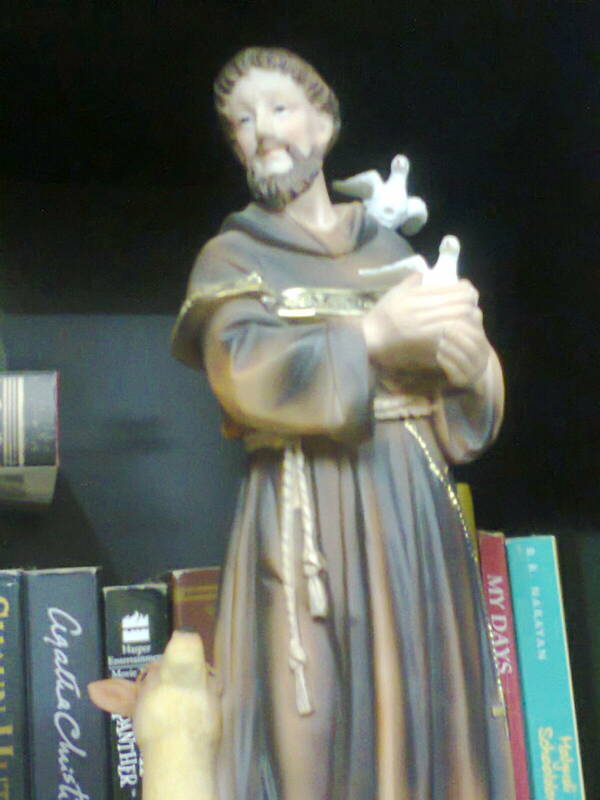 He does so to merge the myth with the truth to bring out the essence of St. Francis’ teachings. The extraordinary part of the book is that, the wild passion of the human soul is dramatised to perfection that even if an atheist were to read this book, he would be pulled in with this tide of emotional outbursts. The maniacal side of the Saint is seen by us & also accepted by us maybe because we realize that he is one of us. His passion was for God whereas currently our passion may be for many other concerns like Democracy, elimination of corruption, feminism, Global warming , communalism……it could be anything, but we all have our own goals & our own personal barometers to assess whether we have achieved our goal. The fanatic following of the revolutionary ideals of perfect poverty, perfect chastity & perfect obedience by St. Francis reminds us of our own fanaticism to our own ideals. His extraordinary way of living…..his stigmata….his fasts……..his bleeding body……..his hunger…..his yearning for Saint Clara…….his semi blindness all shows a level of extreme that was revolutionary for its time & age. It was not accepted readily of course & he resented it much, but did not complain. His job was to show the passion of his devotion to the world, which he did……which we daydream about too…….to show our ‘different’ ideas to the world which wants us to conform with its own set rules. St. Francis in the novel & in real life never followed the bandwagon but was always standing apart & therefore went the distance. The novel finally is a revelation into our own hearts & minds……..what is our real mission in life? To conform to something that is not right or to change the rules….even if it takes us to the brink of insanity…..or sainthood!